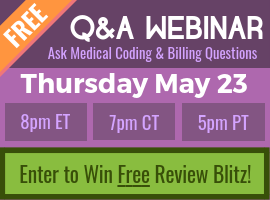 Q: Could you review how to code for measurement and monitoring in ICD-10-PCS with examples? Well, as you know I love ICD-10 and I also really enjoy ICD-10-PCS. 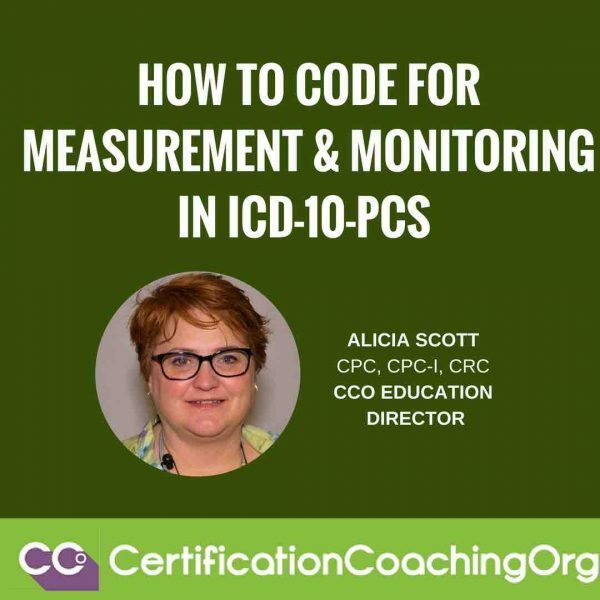 Since we do a weekly student webinar for ICD-10-CM and PCS and Risk Adjustment we’ve been working through some of these examples and Measurement and Monitoring is very commonly used in ICD-10-PCS. I have to tell you that I picked this question because it is an awesome question and I love talking about ICD-10-PCS but because of miscommunication, Chandra went in and created this wonderful answer sheet for me. So, again, she did the work and I get to tell you all about it, which is actually the fun part. So, we give kudos to Chandra for putting this together for us. A: The first thing you have to know about PCS when you’re working with ICD-10-PCS is that it is not like ICD-10-CM and it is not like CPT. What makes PCS different is that it’s not diagnosis coding, so when you see ICD-10 you just automatically think diagnosis. We’re talking about procedure codes, and so of course you think, “OK, CPT,” but we’re not talking about CPT codes. These are things still that you’re doing to a patient in an in-patient facility environment and there are not CPT codes that cover this. In the past with ICD-9, this was bundled in into Volume Three – some of you may remember that – but with ICD-10 now ICD-10-PCS has its own manual. So, you can now separate the way that works. You potentially have to get another manual though because you have ICD-10-CM, PCS and everything. The first thing I want to talk about is Measurement and Monitoring. Measurement – when you think of how to divide PCS, you always have to look for the key term, and the key term with PCS is a little different, a little more complicated than CPT or ICD, those are real straightforward, unlike PCS. So, when you’re looking to code something you have to think, “What am I doing?” and with Measurement, you’re determining the level of the physiological or physical function at a point in time – you’re measuring it. But if you’re Monitoring, you're doing the same thing repetitively over a period of time. So, if you understand the definition of those then it will help you to determine if that what you’re trying to code is in a measurement or monitoring area. Now, PCS is not really a puzzle, it’s like putting blocks together and it’s done with a graphing system, not like anything with CPT or ICD at all. It’s very unique. So, you have to get the keyword first and it isn’t always the term you’re thinking of. We’ve got some examples of measurement and monitoring that you may not have thought of as falling into that category. What you have to do first is get the root operation – that’s what they call it in PCS – and you need to find that or I would say the key term to be able to go from that point to put your blocks together to build the code, expand it out, and then you think of a little set of blocks. I always think of my mother-in-law would purchase those little wooden blocks or the little tiles for your Scrabble games and then she would spell everybody’s name out in the family and put it in this little neat thing that she had. That’s what we’re doing – we’re spelling out the whole procedure. 1. Monitoring of urinary flow. The first objective is to determine what is the procedure being performed. What’s being done when we’re measuring or monitoring. Then, the next thing you need to determine is where on the body that you’re going to be working, that’s the next step. So, you take it one step at a time. Chandra found a great graphic here, so let’s start with something simple. Urinary flow. If you’re in the hospital for any extent of time – lots of people get catheters but even if they haven’t got a catheter they may be monitoring how much urine input and output that they have. 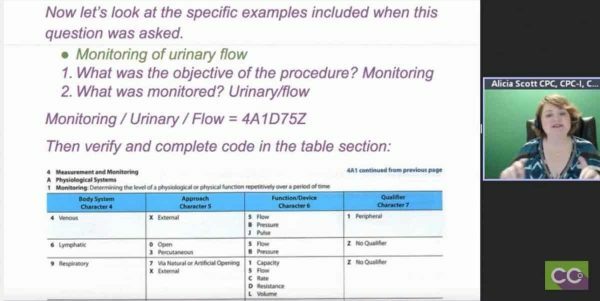 So, for monitoring urinary flow, what is the objective of the procedure? We’re monitoring. We’re going to look again and again and again repetitively and monitor. Then, what body system are we working with? What body part? It’s the urinary system and flow. So, you look up monitoring, urinary and flow – that gives you the blocks. So, the code is going to be 4A1D75Z. Now, how did we come up with that? When you look in your manual, it has an index and a tabular just like the other three manuals but the first term that we looked up was Measurement and Monitoring – it’s all in the same category, so see that’s a four. This is a great graphic that Chandra found. The next thing is the physiological symptoms, A. So, we have “4A” so far. Then, what are we actually doing? We’re in this section – we got our first block, we’re doing measurement and monitoring. The next is an A – what are the physiological symptoms; and then the next block is a 1 – we’re monitoring and that’s repetitive. Then, we need to know body system. The fourth character is the body system. Look at all the things that we can measure and monitor. This is where the table comes in – venous, lymphatic, respiratory, gastrointestinal – but we’re doing urinary, so that’s a D that gives us our next block. Approach – How are we getting this information? How are we monitoring it? Well, via natural or artificial opening. Via natural would be you’re urinating. There’s no artificial opening there but we have several choices, so 7 builds the next block. Function or Device – This is interesting, so we look at our choices and we go down to Urinary because we’re going across. Once we’re in Urinary, we have to stay on that level of the graph and we’re given a choice – 3, 5, B, D and L and we’re doing flow, wasn’t it? Or was it L, I can’t remember. So 5 – it’s the flow; urinary flow is what we’re doing. Then, the last character, if we don’t have a qualifier and then you’ll see different examples, if we have nothing in the next block that needs to be filled out it’s a Z, that’s no qualifier. I think of that as an X in ICD-10 – it’s a holding place. They call it “no qualifier” but in my mind that’s how I think of it. You got to have a holding place there and it’s a Z. Sometimes, you'll have two Z’s but that’s how you put it together. 2. Fetal monitoring of cardiac electrical activity via natural opening. Now, let’s look at some other examples. We walked through this one. 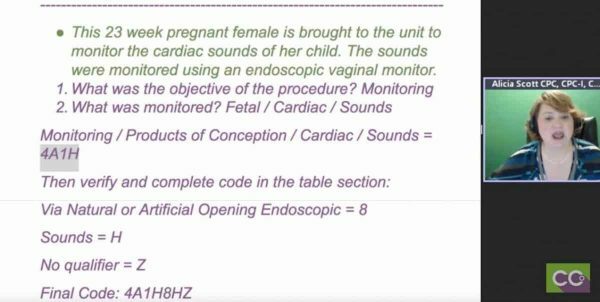 This time, we’re not going to show you a graph but I’m going to give you the verbiage/the terminology that you need – “Fetal monitoring of cardiac electrical activity via natural opening.” Actually, what they can do with that is ‘fetal’ is going to be the baby and cardiac electrical activity via natural opening. There are a lots of ways to do fetal monitoring but you have to know fetal is the baby – hasn’t been born yet – so fetus/fetal. Once the baby is born it’s going to put you in another category for monitoring. What they can do, there are several ways they do this, but one of them now is they literally, once the woman’s water broke, they can go up and screw a little device – a little cord into the baby’s head – and it monitors their cardiac output. What’s the objective? What are we doing? The first thing we need to know, our key term is, we’re monitoring. Now, it’s a little different after that. 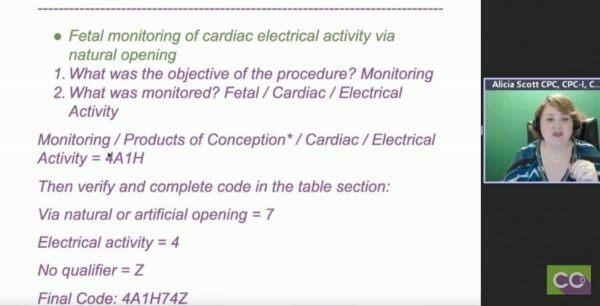 What are we doing – fetal cardiac; what type – electrical activity. Then, that gives us our first section – right there at the top – 4A1H is going to answer those questions. Then, once we got that, then we’ll go down to the next block, and then to complete the table we’ll just keep filling in the blocks across after we’ve got the H and we’ve got natural opening. What are we doing? Electrical activity. Then last, there’s no qualifier so there’s nothing else that we need. The code for that particular monitoring is: 4A1H74Z. Just because I had a student do this the other day on our ICD-10-PCS, be very careful when you get into codes that are zeros – the number 0 – and the letter O because they look different. When you’re typing it can be very confusing so I always do a strikethrough on the number zero if you’re having to write these out, just a little heads up. Also, just a little hint – a fetus is considered product of conception. That is also a term that we don’talways think of. With PCS, you have to put on a different hat. The verbiage isn’t necessarily the first thing that comes to mind and that’s what people struggle with when they’re working with ICD-10-PCS. The verbiage in CPT isn’t always the PCS verbiage. You have to think, I’m doing in-patient, what boils it down, what am I actually doing? I’m monitoring. What am I monitoring? The products of conception – a fetus,” the baby hasn’t been born yet. 3. Monitoring of respiratory flow, via nose – nasal cannula. Here’s one that’s very common again. The objective: we’re monitoring. What are we doing? Respiratory is the body system. For what? The flow. So, monitoring, respiratory and flow gives us the codes 4A19. So, we’d look in the Index, monitoring, then go into respiratory and flow, that gives us to the section 4A19. Then we go to the Tabular, we open it up, you’ll see a graph like Chandra put in there and that’s when we can fill up the rest of the blocks – via natural or artificial opening. See how the verbiage repeats itself? So, once you get the idea of the verbiage, PCS becomes a lot easier; but in the beginning it’s a little harsh on you trying to say, “Well, that’s not what it is.” Well, yeah, that’s the verbiage they use. So, that would be a 7, the flow is a 5 and the qualifier is a Z. 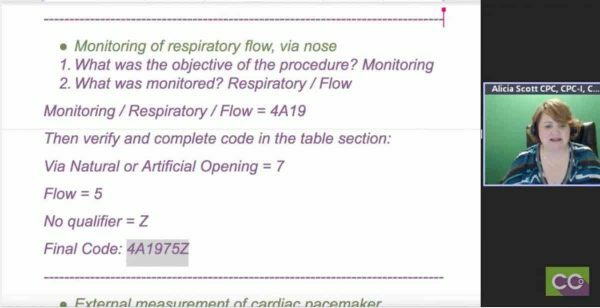 So, if a person is monitoring the respiratory flow it’s going to be: 4A1975Z. 4. External measurement of cardiac pacemaker. I think we have the last one that is also a very common PCS code – “External measurement of cardiac pacemaker.” What’s the objective here? We’re not monitoring anymore, we’re measuring. So, you're going to go to the index to measurement. What are we measuring? The cardiac is the body system – cardiac. What are we actually measuring in the body system of cardiac? The pacemaker. So, that’s going to give us our basic code, and then once you fill out the rest of the boxes, you're going to have: 4B02XSZ. We did have one more. These are some that I had come up with that were very common, I thought, that you’ll see in our in-patient setting. “This 23-week pregnant female is brought to the unit to monitor the cardiac sounds of her child. The sounds were monitored using an endoscopic vaginal monitor.” So, what’s the objective? We’re monitoring. That’s where you go in the Index. What are we monitoring? Fetal cardiac – that’s the body system – but what is it? It’s the sounds. It’s the sounds. Now, did you think of that? No. Then, we start out with our 4A1H, then you go to the Tabular, you go to the section of 4A1H and you fill in the rest of the blocks. You now have a column and it’s like a drop down, then I can answer this column and this column. The next is via natural or artificial opening endoscopic is 8. What is that it again? Sounds. No qualifier, Z. That gives us a PCS code of: 4A1H8HZ. I think that was the last one, but to just wrap up PCS, the verbiage, keep in mind, is not like CPT. It’s similar but it’s a little bit different. So, probably the best way when you’re first getting in to PCS is to sit there and go through the Index. Go through the Index and see the options that are going to be given to you. It takes a little time to pick it up but once you get it, it’s so easy. Again, you’re just building the blocks. Think of a Scrabble board and you're building words or a little scenario that each letter or character explains something else. Unlike ICD-10 or just CM, where a 9 is usually always unspecified. Some of that happens with PCS where a Z is no qualifier but you may see an H in one section of measurement monitoring but an H may be in another section – the first four digits – of a completely other area and it’s not the same thing. H isn’t always the same thing throughout the Tabular. Again, you have a graph for each one and once you get going it’s so much fun to do, you’re creating a formula. I love chemistry. It makes me think of that, but that’s it! That’s the basics of how you can put together PCS codes and measurement and monitoring is just used a lot. If you can start there, then you can expand out.